Faith and business are the topics of discussion today. 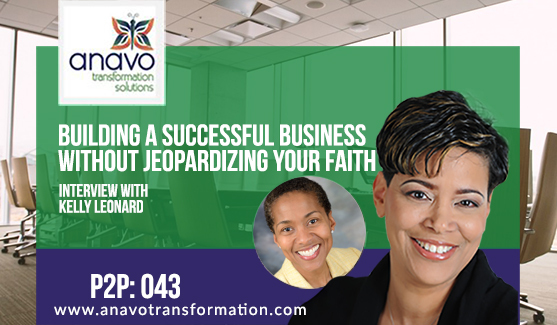 The question on the table is: can you have a successful business without jeopardizing your faith. That’s a question I get often from many CEO’s I work with. I can tell you as a faith-based leader, I started my business with that question as well. I try to make God my CEO… and sometimes it’s not easy. Today I’m talking to Kelly Leonard, a fellow business owner who shares the same standards that I do in leading a business with strong faith. Today I’m talking to Kelly Leonard, speaker, trainer, award-winning CEO, and former Fortune 100 Vice President. A certified public accountant (CPA inactive) with more than 25 years service in the government, non-profit, private and public industries, Kelly has an innate ability to connect with diverse audiences across disciplines. Kelly is CEO of Taylor-Leonard Corporation in which she oversees training and business development practices. How did you get started with Taylor-Leonard Corporation? What keeps you going in your business? How do you ground yourself when times get stressful? What do you do when you’ve taken on the wrong client? How do you continue to operate with intention? How Kelly gives back through her business. How she makes sure she doesn’t compromise her faith in her business. What Kelly does to get back in alignment. How Kelly has recognized other business owners with faith. What the Niamiyah Project is and how it’s changing the landscape of business.